§ 400.370 Scope of Provisions. § 400.380 Parking Requirements: Residential Uses. § 400.390 Parking Requirements: Non-Single-Family Uses. § 400.400 Design Requirements: All Parking. § 400.410 Minimum Off-Street Parking Dimensions. § 400.420 Required Parking Spaces. § 400.430 Americans With Disabilities Act (ADA). § 400.440 Reduction of Required Parking Spaces. § 400.470 Repair, Service or Sales Use of Parking Facilities. Section 400.370 Scope of Provisions. Section 400.380 Parking Requirements: Residential Uses. Section 400.390 Parking Requirements: Non-Single-Family Uses. Section 400.400 Design Requirements: All Parking. Section 400.410 Minimum Off-Street Parking Dimensions. Section 400.420 Required Parking Spaces. Section 400.430 Americans With Disabilities Act (ADA). Section 400.440 Reduction of Required Parking Spaces. Section 400.470 Repair, Service or Sales Use of Parking Facilities. All buildings or structures hereafter erected, constructed, reconstructed, moved or altered in any manner so as to enlarge or increase capacity by adding or creating dwelling units, guest rooms, floor area or seats, shall be provided with off-street parking spaces, except for uses in the City's "Old Town" districts, pursuant to the following requirements. Parking spaces required by this Chapter shall be located on the same parcel of land that the residential use is located and on a driveway only. Trucks and trailers designed and manufactured for or used for specific commercial purposes, including but not limited to wreckers, dump trucks, tracked vehicles, buses, construction vehicles, equipment vehicles, equipment carriers, bottling works delivery trucks, grain trucks and refrigerated trucks are prohibited from parking in any residential district. Any vehicle (excluding recreational trailers, boats and recreational vehicles) in excess of ten thousand (10,000) pounds gross vehicle weight is not permitted for a period of more than seventy-two (72) hours in any one-month period. No unlicensed or inoperable motor vehicles may be permitted on any tract, premises, lot or parcel within a residential zoning district unless parked in a garage. No such vehicle may be parked on any City street, alleyway or right-of-way adjacent to said property. It shall be a violation for any property owner, lessor, or resident thereof to allow an above-described motor vehicle to be maintained on such property. It shall not be a defense that the person charged is not the owner of any such motor vehicle. This Section is consistent with the International Property Maintenance Code as adopted by the City of Owensville, as may be amended from time to time. Any violation of this Section shall be punishable according to Section 100.050 of the Owensville City Code. Exceptions. Any type of commercial vehicle, regardless of gross vehicle weight, when used for delivering or picking up merchandise for delivery or employed in performing a repair or construction service may park for the purpose of making such pickup or delivery or for the duration of the period during which a repair or construction service is being performed on or to property in the area where parked. Stormwater management. Parking and loading facilities shall be provided with adequate stormwater drainage facilities to prevent damage or inconvenience to abutting property and/or public streets and alleys. Lighting. Lighting shall be provided to illuminate any off-street parking or loading spaces to be used at night. If provided, such lighting shall be maintained, arranged and installed to deflect, shade and focus lights away from adjacent properties. The height, type, spacing and degree of light standard may be further regulated by the City Engineer in relation to specific site conditions or type of development. Markings. All non-residential parking spaces shall be marked by durable painted lines at least four (4) inches wide and extending the length of the space or by curbs or other means to indicate individual spaces. Signs or markers located on the surface within a parking lot shall be used as necessary to ensure efficient and safe traffic operation of the lot. Maintenance. The surface of all parking and drive aisles shall be kept clear of trash and debris, and the parking spaces shall be clearly striped and marked. Parking lots shall be maintained free of surface defects. Curbs. Curbed islands are required at the ends of aisles where necessary for traffic control or drainage. Turn-around. All areas for off-street parking shall be so arranged that vehicles can turn around within the area and enter the street or roadway in such a manner so as to completely eliminate the necessity for backing into the street or roadway. Increase in parking demand. Where a change or expansion in use creates greater parking requirements than the amount being provided, no building or occupancy permit shall be issued until provision is made for the increased amount of required off-street parking. No off-street parking space required under this Article shall be used for any other storage or parking purpose. Driveways leading to a parking lot shall not be used for parking. If the building is being constructed as a shell for a future office/warehouse, the City shall calculate the number of parking spaces based on a minimum of twenty-five percent (25%) office and the remainder a warehouse. No occupancy permit shall be authorized until the required parking and approved ingress and egress are properly installed. The provisions of this Section apply to all vehicle parking spaces and loading areas. In all zoning districts, all parking and loading areas, including driveways, shall be paved with asphaltic concrete, Portland cement concrete or other material approved by the City Engineer. Off-street parking areas in all zoning districts shall provide ingress and egress to any public right-of-way only at such locations as approved by the City. No parking or loading space or area needed for loading and unloading shall obstruct pedestrian and vehicular movement on any public right-of-way, including public walks, streets and alleys. No parking space required or otherwise provided in an enclosed structure shall project beyond any required yard, setback or building line. 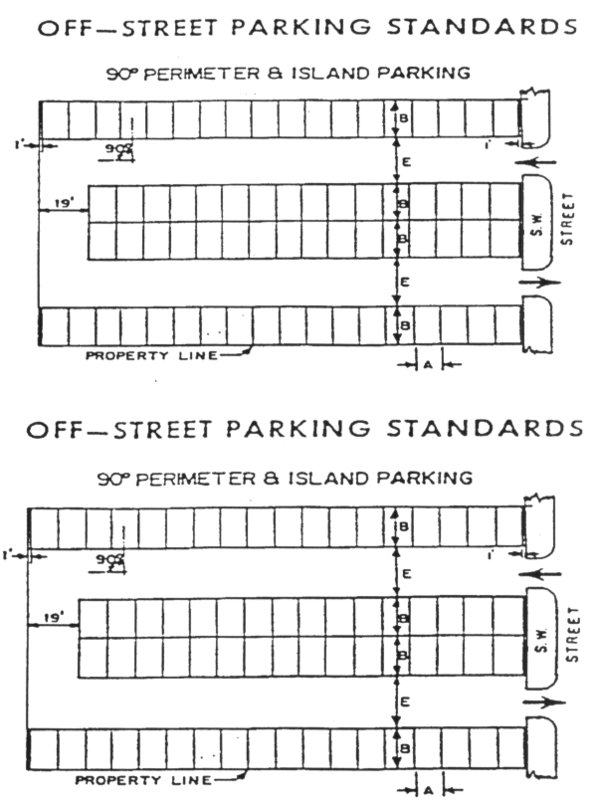 A stall dimension of eight and one-half (8 1/2) feet by eighteen (18) feet [arranged at ninety degrees (90°)] may be permitted for off-street parking stalls provided in excess of the minimum requirements as set forth in this Section when designated for compact car use. On-site parallel parking stalls shall be nine (9) feet by twenty-three (23) feet adjacent to a twenty-two-foot two-way lane or a fifteen-foot one-way lane. Access aisles in parking lots must be at least twenty-two (22) feet wide for two-way traffic (twenty-four-foot round radii), and fourteen (14) feet wide for one-way traffic. One-way traffic aisles must be clearly marked with directional arrows on the pavement at each intersection with another aisle. All areas for off-street parking, excluding those of single-family and duplex residences, shall be so arranged that vehicles can turn around within the area and enter the street or roadway in such a manner so as to completely eliminate the necessity for backing into the street or roadway. Any lights used to illuminate the parking area shall be arranged, located or screened to direct light away from any adjoining residential use. Lighting standards shall in no event exceed sixteen (16) feet in height. Any parking that exceeds the minimum required parking stalls shall utilize permeable pavement as approved by the Public Works Commissioner. Table 1.1 provides the required parking and drive aisle dimensions for parking in all districts. In the event that the desired parking angle is not specified by the below table, the City Engineer may specify other equivalent dimensions associated with the desired parking angle by interpolating from dimensions listed in Table 1.1. Off-street parking shall be provided as required in Table 1.2. When determination of the number of off-street parking spaces required by this regulation results in a requirement of a fractional space, the fraction of one-half (1/2) or less may be disregarded, and a fraction in excess of one-half (1/2) shall be counted as one (1) parking space. When a structure or development contains mixed uses, the off-street parking requirements shall be calculated for each individual use, and the total parking requirement shall be the sum of the individual parking requirements. 4 spaces for every 1,000 square feet (sf) of gross floor area (gfa) of sales and showroom area and 3 spaces for every service bay. This shall not include space provided for vehicles for sale or lease. Clubs, civic or fraternal lodges, museums, libraries, etc. 1 space for every 5 seats; 10 spaces minimum. 1 space for every employee and 1 space for every 4 students over 16 years of age. Parking shall be provided for indoor/outdoor places of assembly as per this table. Exception: Within the Old Town Districts, parking spaces may be waived on a case-by-case basis as approved by the Board of Aldermen. The construction and renovation of certain structures and facilities must conform to the provisions of the Americans with Disabilities Act (ADA). Table 1.3 indicates the number of accessible spaces required by the 2010 ADA Standards. One (1) of every six (6) required spaces must be van-accessible. ADA Parking Space Size Specifications. Accessible parking spaces need to be at least ninety-six (96) inches (two thousand four hundred forty (2,440) millimeters or eight (8) feet) wide and should have an adjacent access aisle. In the case of van-accessible parking spaces, an adjacent access aisle that is eight (8) feet wide is required. Standard vehicle parking spaces (cars) must have a five-foot-wide access aisle adjacent to the parking space. Regulations allow two (2) adjacent parking spaces to share a common access aisle. Parking spaces and access aisles shall be in level with surface slopes not exceeding 1:50 [two percent (2%)] in all directions. All access aisles should remain free of obstructions at all times. Parked vehicle overhangs shall not reduce the clear width of an accessible route. The boundary of the access aisle must be clearly marked. The end may be a curved or square shape. Parking spaces designated for physically disabled persons shall be located on the shortest possible accessible circulation route to an accessible entrance of the building. In separate parking structures or lots which do not serve a particular building, parking spaces for physically disabled persons shall be located on the shortest possible pedestrian route to an accessible pedestrian entrance of the parking facility. Each parking space designated for physically disabled persons shall be provided with a freestanding sign bearing the international symbol of accessibility in white on a blue background. A parking area used for dead storage of new or used motor-driven vehicles held by a licensed franchise dealer, agent or manufacturer is exempt from this Section. The minimum parking requirements may be reduced in all zoning districts by ten percent (10%) of the required parking spaces, if the Administrative Official finds a necessity for such reduction. Two (2) or more uses may combine to provide the required parking space jointly; however, the parking space so provided shall equal the total space required if each use were to provide parking space separately. Plans for such joint parking must be approved by the Board who shall, after approval, record the parking plan and an agreement among the owners of the various properties involved with the County Recorder of Deeds. Such recorded plans and agreements shall be binding upon the owners of the properties involved and their successors and assigns and shall limit and control the use of land included in the plan to those uses and conditions approved by the Board and agreed to by the owners of the properties involved. Adequate loading space shall be provided within the site to accommodate the loading and unloading of trucks, tractors and trailers serving commercial, industrial or any large-scale residential or institutional use containing a gross floor area of 2,000 square feet or more. Loading spaces shall be provided as required in Table 1.4. The required off-street loading spaces shall have adequate means of access to a street, alley or highway in a manner that will least interfere with traffic movement. The loading spaces shall be located behind the building line. The City may require landscaping, fencing or other materials to screen the loading areas. The loading spaces must be paved with a minimum of nine (9) inches Portland cement concrete or any other material approved by the City. Each ten-foot-by-forty-foot loading space required by Table 1.2 must have seventy-five (75) feet of maneuvering space and shall have a vertical (height) clearance of not less than fourteen (14) feet. The loading space that is utilized for the location of trash collection shall be screened with a privacy fence or any other material approved by the City. It shall be unlawful for the owner, operator, lessee or attendant of any parking lot to permit motor vehicle repair work, service, vending, selling, offering for sale or display of merchandise.